I sketched Tsubasa yesterday cause I found my sketch book :p and I posted the sketch on twitter with Tsu-chan's twitter @tsubasamasuwaka and to my surprise she retweeted my tweet and commented back!! XD I was super shocked and nervous since she said "天才！♥欲しい！" which said "Genius! ♥ I want!" Omg Eki thats amazing! your so talented. that is amazing, it looks just like a picture! OMG Eki it is perfect! wow u are more than talented and it is so gorgeous. Of course she'd want it, who wouldnt? just look at both pictures and they are identical. I am so amazed at every talent you have and i truly admire you! and u are so nice as well....u are too sweet to post the scans of the magazines u have for us.....Seriously, I love the drawing and be proud girl because it is perfect!!!!!!!!!! It's beautiful, so talented Eki! It must be such an honor to have Tsubasa retweet you! And you are so lucky that Tsubasa retweeted you! You're so talented and I sure hope she responds back!! I'm sure she will!! Good Luck! OMG! You are an amazing drawer! Take your time to regroup and relax Eki! That's really good! You're an amazing artist!! Wow! You're VERY talented! <3 I wish that I could get this good someday! Your shading techniques are amazing! That's so close to the photo! You have amazing talent! that is awesome! wish i could draw like that! Take all the time you want to de-stress. Sometimes all you need is just a break off from your normal routine and you'd be up and running again. Hope you feel much better soon! Ooh, you are really good at drawing too! 8D How wonderful! oh gosh, you are soo talented!! so talented!! It looks like a black and white photo of her! so so so so beauuuuutiful! Wow. You are good! Make me feels like taking up sketching too!! WOW you are a true artist...that is great anyone would luv it including Tsubasa..great great...was wondering what kind of camera do you have its great! Wow! That's a really beautiful drawing! @Eki: You have an incredible talent! I'm so addicted to your blog!!! omg!! you are perfect eki do you have deviant art to follow you there too? 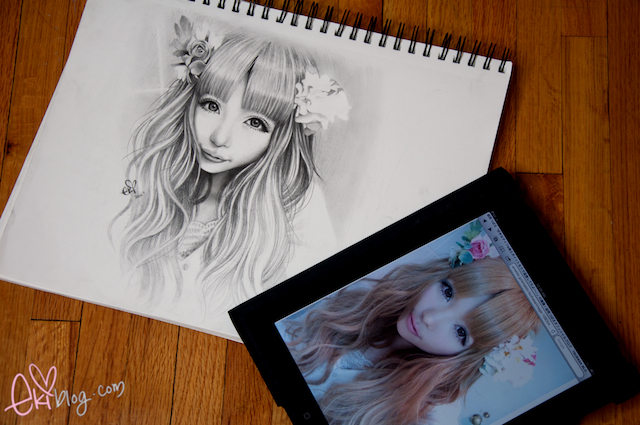 Your drawing even looks better than the original, so amazing!! That sketch is almost perfect! very near perfect! Tsubasa is so pretty! but I also think both of u r beautiful !!! ^^ ! Found this on facebook and I must say my mind is... blown into milky proportions.